We provide our customers with a range of epoxy insulation washers, which is known for remarkable features and durability. 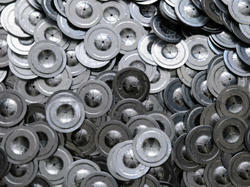 These washers are available in various sizes, dimensions and grades. Further, these are widely focused to the electrical, automobile, construction and engineering industries. It is available to our clients at affordable price range. Insul washer (left), insul plate (middle), bearing bush (right). Description: insul washer (left), insul plate (middle), bearing bush (right). Application: insul washer and insul plate used in alternator. Bearing bush used in Automobile wiper. We provide our clients with a range of epoxy insulation washers, which is known for exceptional features and durability. These washers are available in various sizes, dimensions and grades. Further, these are widely catered to the electrical, automobile, construction and engineering industries.